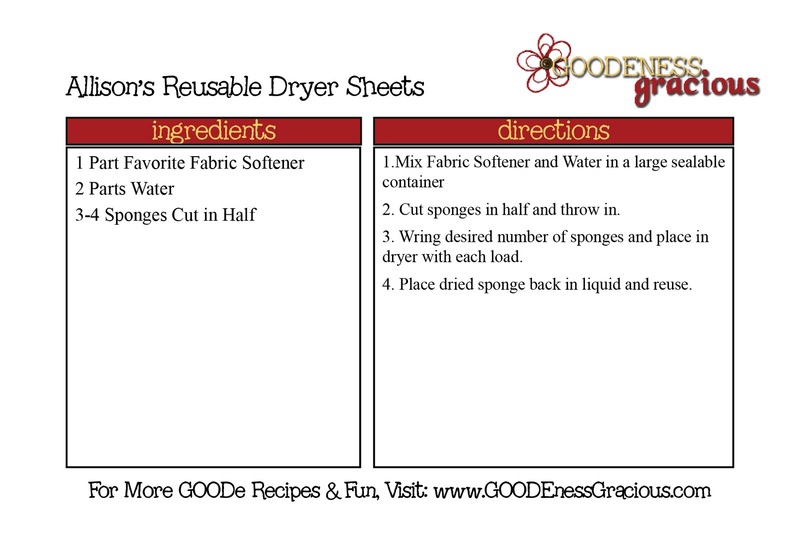 Today’s Super Mommy, Allison shared with us they way she saves a lot of money on dryer sheets, but keeps her laundry smelling nice and feelin’ soft. Allison told me to grab a bottle of my favorite Fabric Softener (mine is Downy–her fav? Gain) and pour it into a sealable container. Anyhoo, then you add two parts water and stir. Grab some sponges and cut them in half. Then wring them out and toss ’em in with your unsorted clothes (ha!–don’t recommend the unsorted thing, it is just how we Goodes roll sometimes 😉 ). Big thanks to Allison for sharing her Super Mommy Secret! Do you have a Super Mommy Secret to share? We’d love to hear about it! You can send it to us here. May have to try this once I'm out of dryer sheets. Thanks for the tip! Great idea! My boyfriend's clothes never smell fresh no matter what I use since he works in a chemical plant. Going to give this a try! I usually pour mine in the softener thingy at the top of my washer, but I'm game to try something new. new follower from friday blog hop. Wow you are good 🙂 Congrats on being featured on Hop Along Friday. I am a new follower. 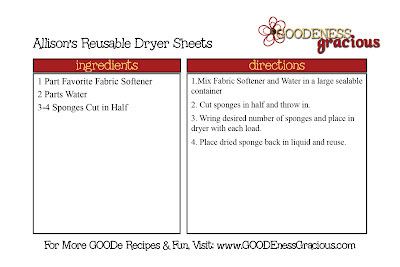 LOve the dryer sheet idea. I make my own laundry soap so that fits in wonderfully. I am your newest follower from the blog hop. I hope you can follow me back at http://mylifeadventurebyme.blogspot.com/2010/09/friday-blog-hops_23.html.